Laurie passed away a month ago, three months after contracting an extremely rare and poorly understood lung disease. She was 58, and leaves behind her husband, two adult children, her mother, her sister, her niece, her nephew, and countless friends from both the physical and the online worlds. It is very difficult to summarize Laurie’s life in only a few words. Rather, let her blog speak for her now that she can no longer speak herself. Following this posting are a number of eulogies from family and friends. 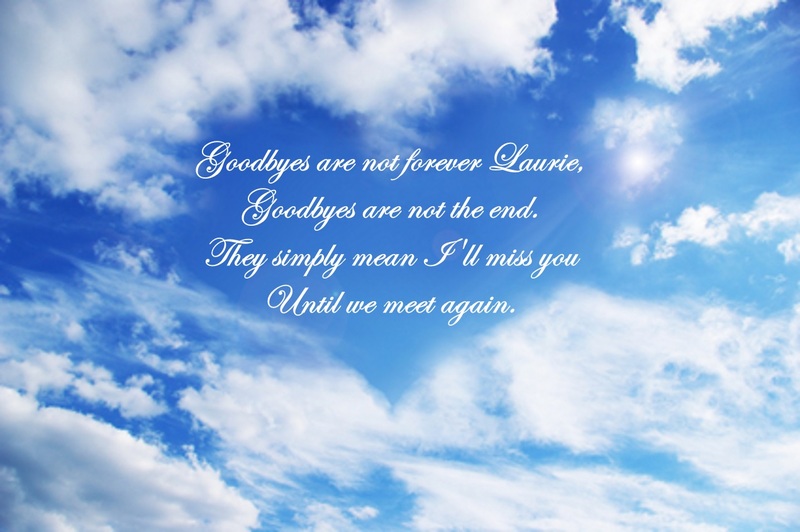 Rest in peace Laurie … we love you and we miss you more than can be expressed. There is a hole in my heart. I’ve lost my life coach, and best friend. Laurie had tremendous common sense and remarkable people radar. Her intuitions were to be trusted in most cases. Laurie’s sage advice was invaluable to me in so many situations. Laurie was the parent most responsible for our two great kids. She poured her heart and soul into the kids, set their moral compass, and made them into the two kind and wonderful humans they are today. I realized this week that some people may not know what illness took Laurie from us ahead of her time. Acute Interstitial Pneumonitis is a disease about which little is known. There is no known cause, there is no known cure. It is a generalized inflammation of the lungs. The odds are against victims of this illness and as we painfully learned, in Laurie’s case, the odds won. Laurie was a great and passionate writer. Her blog, which covered a wide range of topics had several repeating themes including food, fibromyalgia, and family. Despite the impacts of fibro, Laurie had tremendous gusto for life. She was a foodie. We would watch reality food shows after dinner and look at one another saying, I can’t believe I’m hungry again. We would enjoy really good food, whether home cooked or in a restaurant. Laurie spent three nights in the hospital when we thought she had the flu that became pneumonia. She was home for 36 hours before I had to take her back because she was clearly not able to be home. That second admission was on Valentine’s Day. Once she was settled into a room, I went across the street to the CVS to buy her a couple things she wanted. It was already 8 or 9 at night. There, by itself, on the Valentine’s Day shelf was a red fox. Laurie loved foxes. I used to tell her stories when she had trouble unwinding from the day. Prominent in those stories was a Fox that we had seen on a drive through New Hampshire early in our marriage. To me, that fox, alone on the shelf, on a Valentine’s Day that was otherwise a complete bust, called Laurie’s name. I bought it for her. Now this was no ordinary stuffed animal. It was battery operated and wiggled and sang some inane song. Neither of us cared about that. But … the fox was battery operated. Before her illness took a turn for the worse, Laurie was worried the nursing staff wouldn’t give her anxiety meds when she needed them. We wrapped 3 or 4 Xanax in aluminum foil and furtively hid them in the battery pouch of the fox. I knew she never would actually take them, but would rest more comfortably knowing the Xanax was there. At some point, in the last week or two, when Tim and I were at the hospital, one of the nurses told us they had discovered the fox danced, and had turned it on for Laurie. Tim and I exchanged Uh Oh glances, and we looked in the Fox as soon as the nurse left the room, to discover that the staff had found her stash and removed it. No one ever said anything about it to us, nor did we ask. Laurie and I come from similar family backgrounds. Her mother and my father came from Germany. My mother and her father came from Vienna, Austria. Both families blended and bent words from German, English, Yiddish, and Hebrew, creating our own languages. When we got married, my brother was so amused by our blended and made up words that he wrote the Fessler Friedmann dictionary. As an example, we have the word Tobying. Tobying means to take a taste of someone else’s food before that person gets to taste the food. This word comes from a time an old friend of Laurie’s, Toby, took a fork full of Laurie’s dessert before Laurie could get a bite. Laurie’s Dad, Fred, was a rich source of made up words that became part of our daily vernacular. Laurie also relished this next story. One hot summer day, when Tim was about 3, when Laurie picked him up from the woman down the street who ran a home pre-school / day care program, Kim told Laurie she was puzzled. Tim had pointed to a shirtless trash collector and said, “Look Kim, he’s nagkepatzel”. Kim had no idea that in Fessler-Friedmann, that meant naked. When we lived in Mass, there was a cat that would visit our yard and Laurie felt like it was a visit from the cat she briefly had as child, but to which she was allergic. When the cat stopped visiting, Laurie was crushed. Laurie became a dog person late in life. I grew up with dogs in the house. My parents had a dog when Laurie and I first started dating about which Laurie became very fond. I wish I could remember what prompted us to adopt a dog, but once we had our first dog, Laurie would look at me, and say, I can’t believe you never let me have a dog when we first got married. I keep seeing things, reading about things ….. things I want to remember to tell her when I get home; then I remember she won’t be there. After 27+ years of marriage, through better and worse, I find myself alone. Laurie, honey, sweetheart. I miss you so much. I love you. Thank you all so much for coming. I don’t think we can express enough how thankful we are for the incredible love, support, and generosity you have shown through these past few months. It didn’t take me long at all to realize how immense of a support system I have. And for as long as she could, I know that my mom was vastly appreciative of the dozens of offers for food, care for our dog, Lexi, and the prospect of visitors coming to see her. But for those of us who knew my mom, mostly the food. Although it’s easier said than done, I want to happily celebrate her as much as possible in the coming days and weeks rather than sadly mourn. So, I’d like to talk a bit about her and how she affected mine and others’ lives. My mom was my foundation of honesty and compassion. She taught me to be truthful in not only my words, but also in every action; I learned from her to always be genuine in everything I do. Mom cared so deeply about those around her – both those in our family’s close circle and those she may have never met in person. Through every up and down that life threw our way, she maintained that love and kindness for others. Mom never stopped putting others before herself. Her loving, caring, kind personality radiated to everyone around her, even when she was ill. She’s an easy example, yet such a hard act, to follow. We pray, we love, we ask God for blessings for everyone’s friend. Let the dawn come quickly and erase the troubled nights, replacing them with hope and a circle of love from far away and near-by. We pray for strength, courage and healing. We pray individually in a thousand different ways, we pray in groups, in hushed whispers; we all pray together, for one woman, for one family to be blessed with hope and strength and with great, everlasting love. Just the other day, I got a message from Dawn’s daughter. She told me that she reads my mom’s piece every night before she goes to bed and that she has it hanging on her wall. This is what my mom was all about: impacting anyone and everyone she could in a positive way – even if it was one person at a time. Mom also taught me to always keep my promises. So before I finish, I want to make a few promises to her. Mom, I promise to follow in your footsteps. I promise to be honest. I promise to keep on being the emotional one in the house. I promise to think of you whenever I see something bright and yellow. I promise to always be compassionate. I promise that no blog will ever make me as mad, sad, or happy as yours did. I promise to never let our family live in this Holiday Inn ever again. I promise to send food back if it’s cold. I promise to go to Cape Cod again. I promise to get shells from the beach. I promise to NOT accidentally Instagram blurry pictures of vacuum cleaners. I promise to eat dessert. And to never pick chocolate over vanilla. I promise to make you proud. And I promise to always love you. Thank you all again so much for coming. It means more than you ould ever imagine. I love every one of you. Our parents always commented that Laurie and I were as different as day and night.We didn’t resemble each other physically. We thought and reacted to life differently. My friends were not her friends with the except of her beloved Aunt Nancy. Laurie called me moon face and I called her no face. Seriously, her face was so small that she needed to buy glasses frames from the children’s’ section. She was pale and I tended to be ruddy. I envied Laurie’s long slender fingers and soft hands, even in the winter. My hands get rough and chapped and I unfortunately inherited Mom’s stubby fingers. Laurie was the generous one; I was always frugal. When we were young kids Laurie always insisted on paying for my Three Musketeers bar from her allowance.. Money burned a hole in her pocket but conversely, Laurie was often delighted by finding a $10 or $20 bill in the pocket of her jeans, long forgotten. Something I really admired about my sister was that she, unlike myself, was not a whiner. She expressed frustration occasionally during her 6 plus year stint with fibro and all its spin off illnesses she endured but she rarely complained. Laurie tried to enjoy her “good days” and didn’t dwell on the lousy ones. she wasn’t in the mood but somehow felt obligated to answer the call. I raised my eyebrows at Laurie and gave mer a quizzical grin, Laurie nodded vigorously and grinned right back at me. I got on the phone and spoke for about 10 minutes. The caller didn’t have a clue and Laur and I had a good laugh. I miss you so much Laurie, my little sister. And my heart goes out to everyone else who loves you, especially Mom, Dan, Jillian and Timmy. Laurie had added her own response to the email: This is just not right. How dare they compare cinnamon to chunky! It was the latest in a long history of Fessler customer service complaints, a trait that both my mom and my aunt certainly inherited from their father. Anna and I were so lucky to have Aunt Laurie. When I turned 13, Laurie gave me something I’ll treasure forever. It was a hand-made, numbered scrapbook that told that story of my life, starting at birth, and was filled with jokes, family pictures and stories. Shortly after she handed me the scrapbook, she sighed when she realized she’d have to make one for each of the other three cousins. But she outdid herself every time. For Anna’s, she took a whole magazine and turned into “Anna Magazine.” Those scrapbooks were the closest us four cousins ever came to getting bar mitzvah’ed. For most of college, I had a radio show at my local college station. Laurie listened to my show, without fail, every single week, much to the eventual annoyance, I’m sure, of the rest of her family. She treated my show like I was the most famous D.J. in the world, and made me feel that way too. When it came to traditions, there was no one like Aunt Laurie. She cared about the details, always making sure there was Martinelli’s Sparkling Cider for the kids (and for her) at every family meal, and always making sure that on Christmas, the cream cheese and the cinnamon rolls were low-fat. If I had to sum up what it was like to have Laurie as your Aunt, it would be the way she answered just about anything I ever asked of her. It didn’t matter what: can I come over a little later? Can we open the stockings before we eat breakfast? Can you please pass the chunky applesauce? Her answer was the same every single time: Anything for my nephew. I shared many things with my Aunt. We shared a fascination with psychics, a love for old photos and junk food, and, of course, the Fessler sensitivity gene. She also had the same kid inside me—the one that thinks that you are never too old to be spoiled on Christmas and never too full for dessert. While we are sitting here, with the absence of Laurie sitting heavy in our hearts, I know my Aunt wouldn’t want us to mourn her absence today, but to celebrate her presence. Aunt Laurie was always the biggest fan of “the cousins.” She would always lovingly watch the four of us chat together at family dinners, remind us of funny childhood memories, and, back in the day, be the easiest to convince to let us have cousin sleepovers. Sleepover at Timmy and Jillian’s became infamous for the delicious array of cocoa puffs and pop tarts we would eat there, which Aunt Laurie happily gave us under the platform that “kids should be allowed to eat junk food.” She was a cool Aunt, and my Aunt will live on in the friendship my brother and I have with our cousins, a friendship that always made my Aunt very happy. 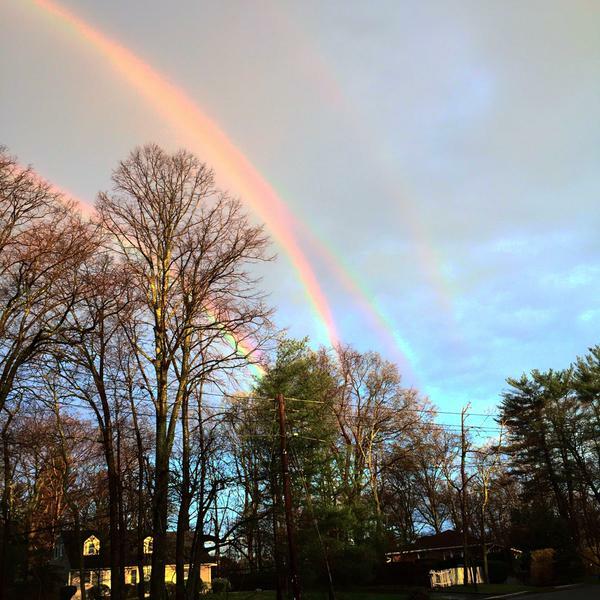 What comforts me the most in this difficult time was my Aunt’s belief in communication with those who have passed, whether it be through signs she got from Papa, or seeing mediums. Her belief in that made all of us have a little more faith in this ourselves. We will all wait for those signs from you, and know that your belief will make their presence all the stronger. You are sorely missed, Aunt Laurie, but I will forever be your Ansie, and you will live on through all of us through all that we share with you, every little thing that reminds us of you, and all the relationships you’ve inspired. My husband Robert and I entered what at first seemed to be a food court. Once Robert had identified the burger joint, his favorite food, he scurried there to order his meal. That left me walking the row of restaurants, pondering all my choices. I stopped to peruse the menu at an Asian restaurant. Noisy customers from the sushi bar further down the row momentarily diverted my attention. As I returned to the menu above the take-out counter before me, I noticed for the first time that we were actually on an enclosed pier. The pier pilings rose through the floor planks that formed the walkway, framing each establishment and rising to create the structure on which the roof above me rested. While pondering my choices, I gazed up at the row of windows above the eateries that went the length of the pier, from the land to the sea. I first saw the blue sky and a seagull, then the ominous presence of a huge tidal wave coming straight towards me. Absolutely terrified, I grabbed the piling to my left and clung to it with all my strength, hoping against hope that I could save myself from the oncoming disaster. The tidal wave struck. Green seawater, filled with seaweed and fish, broke the windows and water started pouring into the food court. I held onto the pier piling for dear life. But to my surprise, the water didn’t sweep me away. Yes, there was water a few inches deep all along the food court, but somehow the wave didn’t destroy the pier. I turned around and looked out a row of picture windows behind me. I could see the wave pass, traveling parallel to the shore. Then a tug boat caught my eye at the end of the pier. It was trapped in the force of the wave, being pulled along behind it. Debris from several other ships surrounded it, but the tug boat was whole, intact, and didn’t appear to have any damage at all. That’s when I saw her. 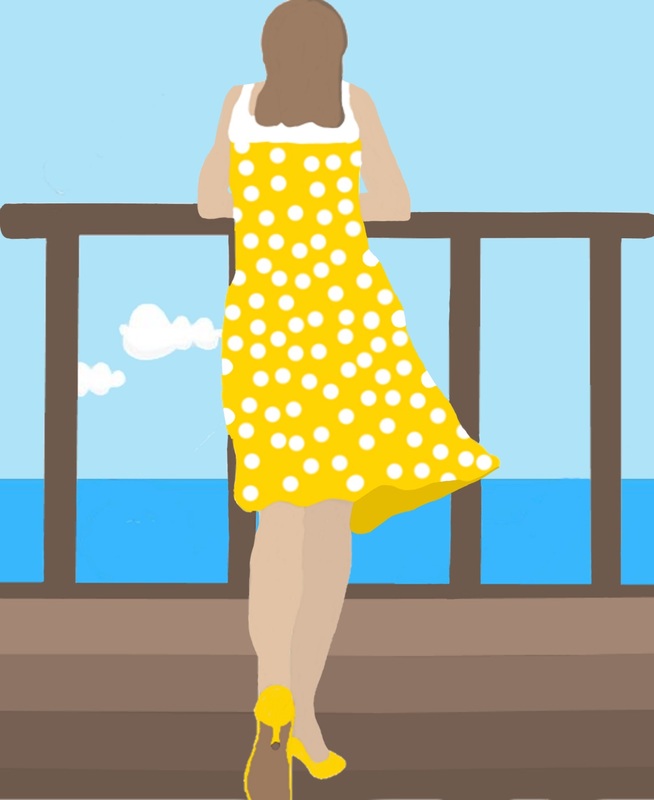 There, next to the smokestack, stood a woman with long light brown hair dressed in a bright yellow dress with large white polka dots. She looked straight ahead in the direction that the tidal wave was taking her, the strong sea breeze blowing her hair behind her. The sun shown brightly upon her, kissing her skin. There was no hint of fear or panic on her face. She held on to the deck railing as if she was on a pleasure cruise and not caught in the aftermath of a tsunami. I watched in amazement as she passed by, my mind filling with questions. Who was she? How did she wind up on that boat? Was there anyone around who could rescue her? Why wasn’t she afraid? Where was she going? I struggled to keep watching her as she and the tug boat quickly faded away into the distance. Just as she disappeared across the horizon, I woke up. Now awake I wonder….was my dream a glipse of Laurie moving on to her next adventure? I was the bearer of such a sign Christmas 2013, when I offered to bake and send her some homemade fruitcake. Fruitcake reminds me of my grandmother, who I lost when I was 16. Fruitcake reminded Laurie of her Dad, who she lost in 2002. She believed that me sending her fruitcake was a sign from her Dad. Me, I smiled and enjoyed the fact that we had one more thing in common. That fruitcake inspire Laurie to write her post “Whoever Said “Facebook Friends Aren’t Real” Is One Big, Stupid Idiot.” (https://hibernationnow.wordpress.com/2014/01/06/whoever-said-facebook-friends-arent-real-is-one-big-stupid-idiot/) She gave me the nickname Sarita in that post…how did she know I always wanted a nickname?!? It’s hard to believe that Laurie is really gone. Chronic illness is a cruel mistress, often demanding all our time and energy. Social media, like our blogs, Facebook and Twitter, make connecting with each other easier. As sick chicks, it wasn’t uncommon to have periods of time when we were silent. But even if one, or both of us, wasn’t up to conversing, we could always visit each others blogs, Facebook timelines or Twitter feeds to catch up. How I desperately want to believe that this is just one of those lulls in our conversation. Laurie was right you know. Being chronically ill feels like being in a state of constant hibernation. To cope with our symptoms, our limitiations and our challenges, we make our worlds smaller, more manageable. We feather nests, snuggle into burrows, build forts with soft, warm blankets and big, fluffy pillows. We decorate our caves with music, words, soft lights and pleasant images to distract ourselves from the pain and fatigue that is constantly nipping at our heels, like the icy winter wind. From these small, warm, safe spaces we live life with chronic illness as best we can, reaching out to each other when we can, making the best damn lemonade we can out of the mountains of lemons someone keeps dumping right outside our doors. My sadness at Laurie’s passing is tempered a bit by the truth that her suffering has ended. And the moment after I think this thought I get angry, beause everyone living with chronic pain and chronic fatigue deserves relief while they are living. I’m upset that while she was here with us she never got the relief she deserved. I’m frustrated that medicine didn’t have the cure or palliative care that she needed. She is gone. And I will never forget my friend Laurie. In her memory, I will donate to the Dysautonomia Information Network (http://www.dinet.org/index.php/help-us/donate) which helps people like Laurie living with Postural Orthostatic Tachycardia Syndrome (POTS). I will also recommit myself to my blogging and advocacy endeavors on behalf of people living with chronic illness, to help empower patients, like Laurie and myself, to ask for and settle for nothing less than the comprehensive care they need to not merely survive but to thrive with ongoing health challenges. There is a group of women who cannot be here today (Laurie’s memorial service), but who instead are holding vigil for Laurie, each in their own home. We’ve known Laurie for years, as a caring and compassionate friend and a loving sister, and Laurie’s loss has reverberated through our group like a tidal wave. We all came to know Laurie because we, too, struggle with chronic illness, even as she struggled with her own illness. She was a truly exceptional person, and we loved her so much – and still do. We are each other’s lifelines, via email, messaging, and phone, helping to keep each other going when our worlds have been turned upside down. Those who haven’t lived with these illnesses simply can’t understand the emotional, mental, and physical toll it takes. So we become very close, and share things between each other that our healthy family and friends can’t understand, or that we don’t want to burden them with. We become a second family, a “chosen family,” and as the years unwind, we share our lives with each other, both the good times and the bad. Laurie was such an important part of each of our lives, so exceptionally compassionate, always ready to put her own problems aside in order to help another, or to offer a shoulder to lean on, or occasionally to cry on. She encouraged us – and occasionally nagged us – to keep fighting onward, during the many ups and downs of our lives, and helped each of us weather many crises, whether of a personal or medical nature. Laurie was also a gifted writer, often surprising us with blog posts that were personal and deeply moving, or fantastic stories to lift our spirits. Tim and Jillian, know that your mother was fiercely proud of you and all your accomplishments, with good reason, and scarcely a day went by without her expressing it! Dan, Tim, and Jillian: Laurie loves you all still, and will always be with you. Never doubt that! Our thoughts, prayers and Love are with you all.